Doxycycline can help treat mycoplasma infections. Doxycycline is a useful antibiotic that can help keep your furry friend healthy. Unfortunately, the drug has some side effects in many cats, including diarrhea. Fortunately, you can make things better for your pet with doxycycline regardless -- as long as you know the facts. Feed your cat before administering doxycycline. A full stomach can help ease the unpleasant side effect of diarrhea. Some veterinarians may suggest Pepto Bismol. Ask your veterinarian if this is recommended and if so, the proper dosage. This over-the-counter med can help your pet if given in advance, but don't give it at the same time. The bismuth in Pepto-Bismol can interact with doxycyline and make things worse. Give your cat any of the mineral-containing medicines more than an hour before you give him doxycyline. Like Pepto-Bismol, these can interact negatively with the antibiotic if your cat ingests them at the same time. 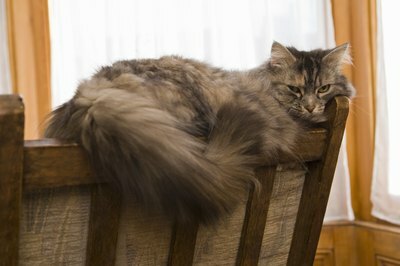 You shouldn't give your cat anything with minerals one hour before, or four hours after, a dose of doxycyline. Avoid feeding dairy products when your cat is on doxycycline. They can make diarrhea worse. Doxycycline is sold under the brand names "Vibramycin" and "Doryx." Tell your vet about all of the medicines your cat is on. Doxycycline can interact with several common meds. Watch your cat for signs of allergic reaction. Some cats are allergic. Do not take your cat off doxycyline without a vet's instruction, though. Never administer any medications - even over-the-counter drugs or homeopathic remedies - without prior approval from your veterinarian.